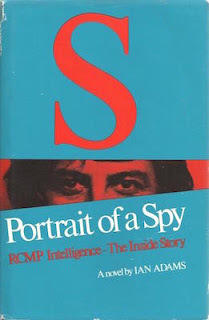 I wrote a great deal about S: Portrait of a Spy in my first book Character Parts, which is pretty much the reason I haven't covered it here. 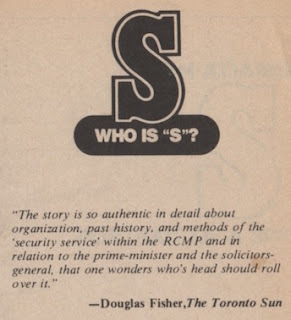 An intriguing novel of political intrigue concerning a member of the RCMP who is suspected of being both a KGB and CIA mole, S generated headlines through my college years. Most came courtesy of Toronto Sun publisher Peter Worthington, who pushed the idea that Leslie James Bennett, former head to the RCMP's Russian Intelligence Service Desk, was the model for the title character. Worthington encouraged Bennett to sue, which is exactly what he did, going after Adams and original publisher Gage for $2.2 million. "A curious resolution, as the disclaimer republished the alleged libel even as it discredited it," noted lawyer Douglas J. Johnson. The Virgo edition also includes a good deal of information on Bennett, much of it gleaned through court testimony. Transcripts are provided. Bennett described Adams' novel as "a typical KGB-type operation" and went so far as to claim that his life was under threat from an RCMP "death squad." 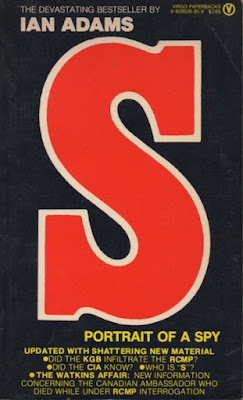 He died in Melbourne of kidney failure on 18 October 2003, four days after the publication of Character Parts. I deny any responsibility.